When winter snow and ice arrive many people use ice melters to prevent slips and falls. But did you know that most ice melters contain salt that can injure your pets and children? Salt-based ice melt products have warnings on their labels regarding the danger they present to pets, children, and the environment. Gaia Enterprises Safe Paw™ Ice Melter is 100% salt-free and is guaranteed pet and child safe (MSDS)! Safe Paw has been used and recommended with confidence for years by veterinarians, animal hospitals, groomers, shelters, and humane societies making it the #1 selling brand! Safe Paw was recently awarded the PTPA Green Product Seal and was included in the 2009 Whole Green Earth Catalogue. This entry was posted in ice melt, pet safe, Safe Paw on January 28, 2010 by yourfriends. A cat named Clyde has been reunited with his owner after a mysterious three-year odyssey in which the long-haired Himalayan strayed 2,400 miles into the Australian Outback. Ashleigh Sullivan, 19, said she had given up hope of ever finding Clyde after he vanished when he was about 1 year old from her family home near Hobart city in Australia’s island state of Tasmania. “I’m positive he remembers. He’s not acting like he’s suddenly appeared somewhere and is frantic,” Sullivan said as she tearfully held her contented cat. A nurse found Clyde wandering at a hospital in the remote Queensland state town of Cloncurry and cared for him for four months before taking him to a local vet (she was leaving town and could not take the cat with her). 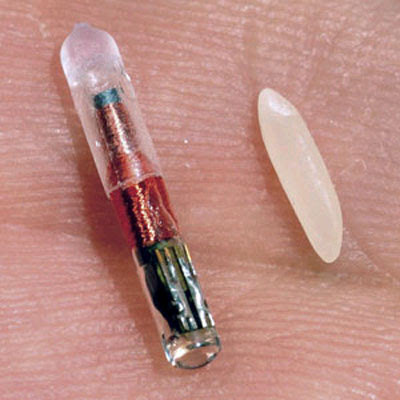 The vet, Donna Weber, traced Clyde’s owner from an identification microchip that was imbedded under the cat’s skin. But no one has a clue how Clyde managed the 185-mile sea journey across the Bass Strait from Tasmania off mainland Australia’s southeast coast, and then more than 2,000 miles overland to Cloncurry, deep in the arid interior of the Outback. 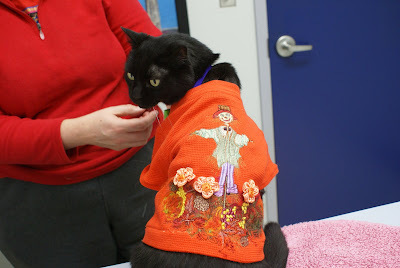 This entry was posted in lost cat, Microchipping on January 25, 2010 by yourfriends. 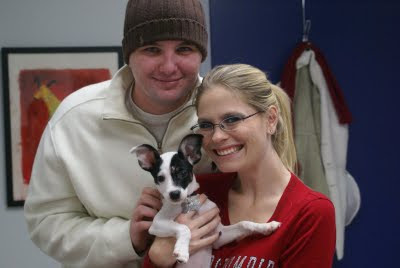 This entry was posted in Jax, rescue on January 22, 2010 by yourfriends. 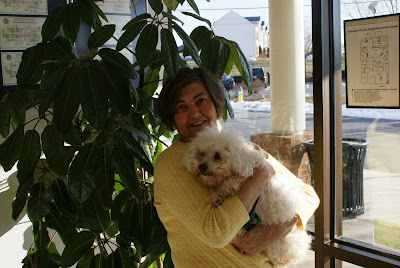 This entry was posted in Bichon Rescue, Misty on January 19, 2010 by yourfriends. 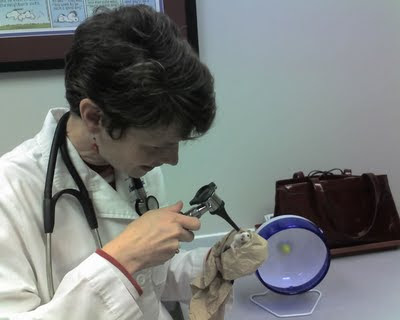 Dr Cardella examines Mrs. Mouse. 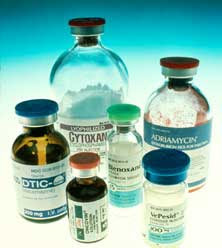 This entry was posted in Dr Cardella, mouse exam on January 15, 2010 by yourfriends. Hi my name is Mikey. 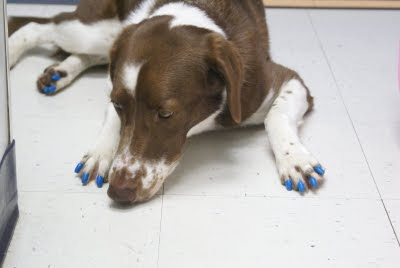 I am a very handsome dog with blue finger nails. No, my mom did not paint them! They are a soft plastic covering called Soft Paws. They help keep me from scratching my mom’s hardwood floors. They work really well! This entry was posted in Mikey, Soft Paws on January 12, 2010 by yourfriends. 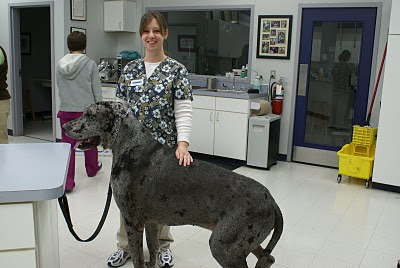 Atilla is a 6 year old Great Dane and weighs 220 lbs! This entry was posted in Atilla, Great Dane on January 9, 2010 by yourfriends. Bagheero came in today for his Semi-Annual exam, Vaccines, and Wellness Diagnostics. Isn’t he handsome? 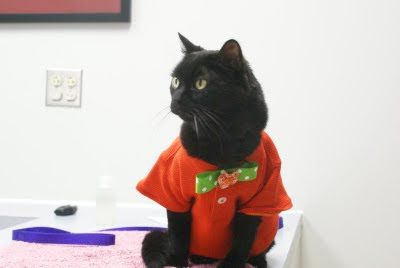 His mom made his autumn themed shirt with complementary bowtie. She is so creative! Thanks again Bagheero for being so great and brightening our day! This entry was posted in Bagheero, semi-annual exams on January 6, 2010 by yourfriends. This entry was posted in death, Izzy on January 5, 2010 by yourfriends.